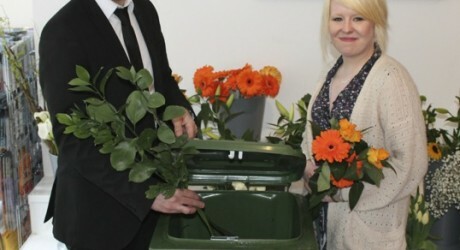 AN Aberdeen florist is the first in the North-east to begin recycling its green waste. Blooms and Balloons, based in Chattan Place, has teamed up with Aberdeenshire firm Keenan Recycling, in a bid to go ‘green’. All organic waste from the florist including flowers, petals, leaves, stems and thorns from the shop will now be transformed into BSI accredited compost at Keenan’s recycling facility at New Deer. Programme manager at Keenan Recycling, Stuart Youngson, said: “Suzie has really led the way for local florists when it comes to responsible recycling. Owner of Blooms and Balloons, Suzie Roger, has an environmentally friendly policy in place at the shop, and says it is important for other organisations to look at their environmental practices.